Please find the attached note from our energy team today that outlines some of our key thoughts on the price of oil. If you’d like to receive the insights of our energy team directly, email . 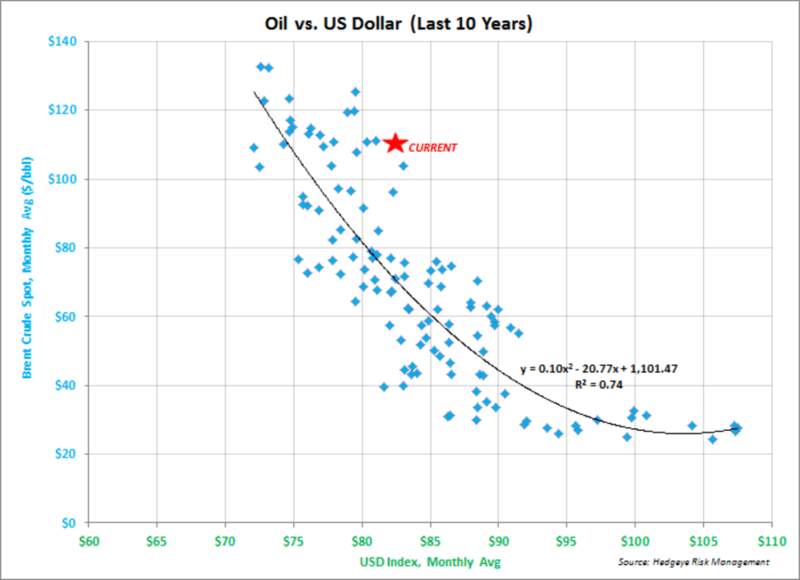 The price drivers of crude oil are difficult to impute because there are many, with some mattering more than others one day, and others the next. 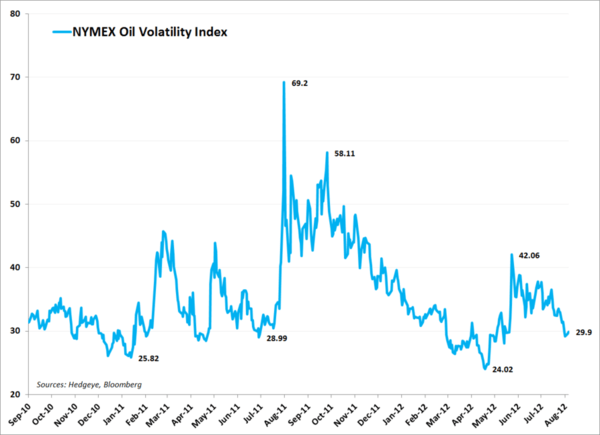 That said, we offer the following series of charts for your consideration in risk management as it pertains to your oil exposure, whether it be via the commodity itself or oil-levered equities. 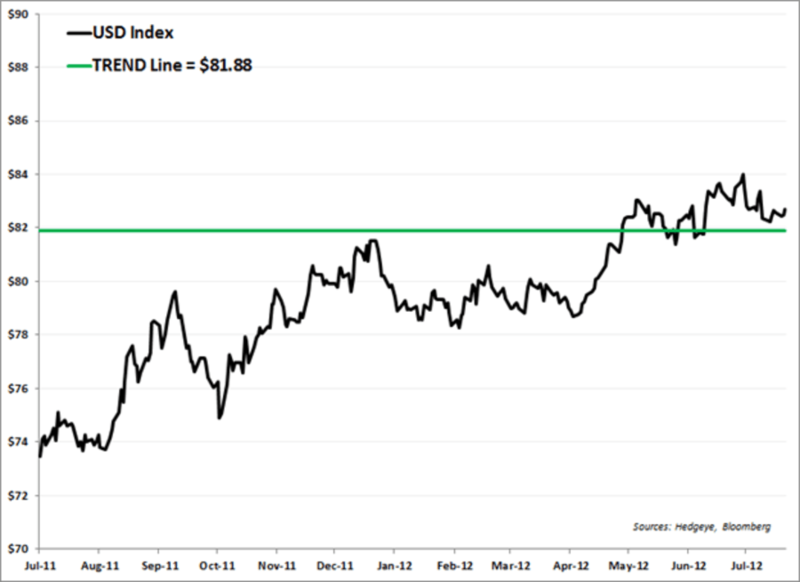 Conclusion: The Brent crude spot (the global benchmark) is +5% YTD and +29% higher from the 6/21/12 low of $88.99. 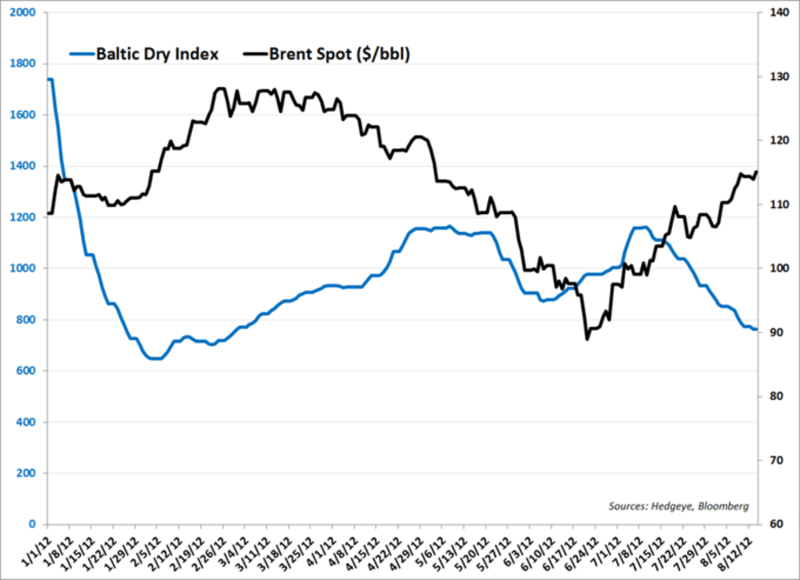 The fundamentals (read: supply and demand) warrant lower oil prices, but expectations for easier monetary policy and fears of supply disruptions (geopolitical risk) have lifted prices recently. Note that the oil market has shrugged off actual data in favor of events that may or may not occur – the Fed has not gone to QE3, Europe has yet to implement a comprehensive solution to its debt crisis (if there is one), and there has been little aside from increased rhetoric out of Iran and Israel – yet oil continues to trade higher in expectation of some or all of those events. Given, the risk-reward setup in crude is skewed to the downside. 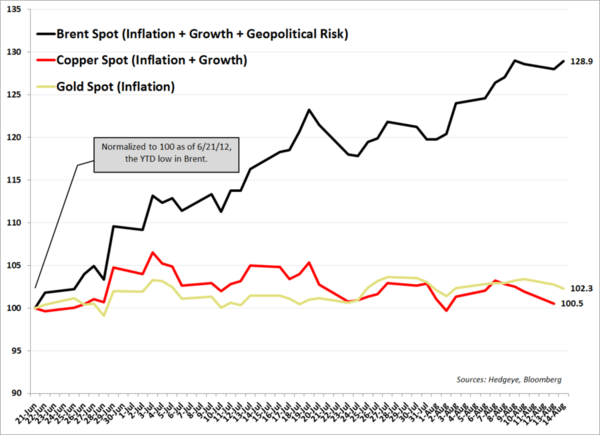 If the Fed or ECB appeases the market – how much of that is already priced-in? And if they don’t – does the market’s focus turn to the weak growth data? 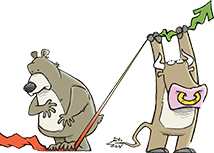 On the geopolitical risk front, tensions in Israel, Iran, Syria, Egypt, etc are all serious tail risks; and the only thing that we can say for certain is that that's not going away anytime soon. 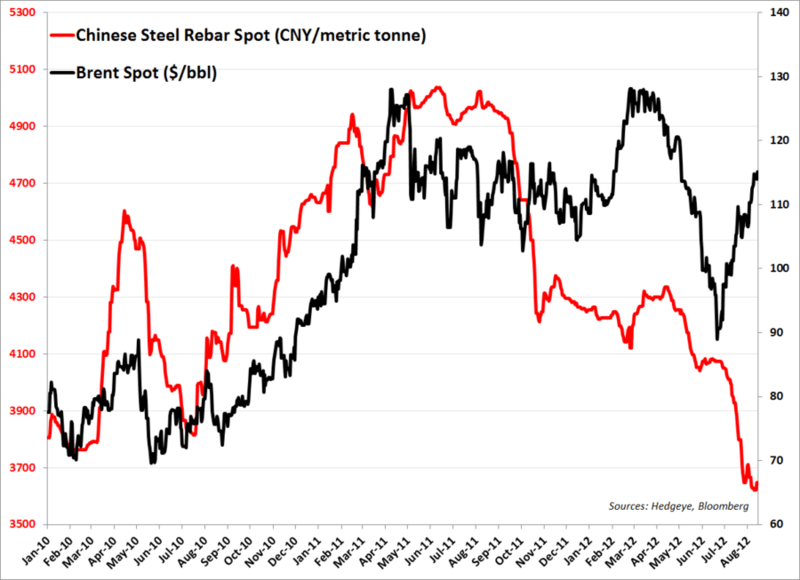 A war-inspired oil price spike would have a dire impact on the global economy given its already fragile state; not even oil-levered equities would perform well in that environment, as has been the case in past instances of Mid-East strife. Brent crude is trading in a bullish formation on our quantitative model. Long-term TAIL support for Brent is at $110.36/bbl. 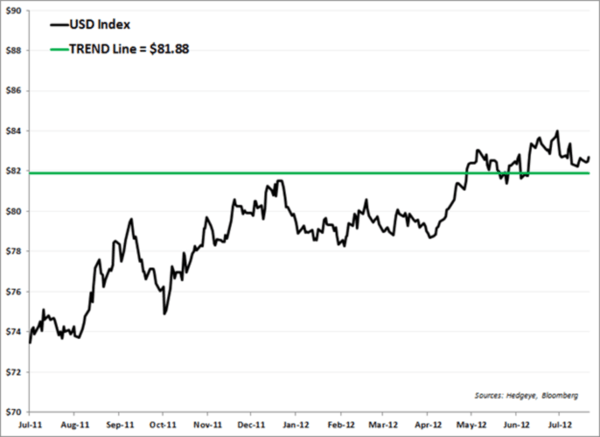 It is +5% YTD and +29% higher than the most recent low of $88.99/bbl, made on 6/21/12. Volume traded was strong in July, +46% Y/Y, confirming the rally. But that euphoria has eroded quickly – the most recent volume studies are nasty at -34% Y/Y for the first 9 trading days of August. 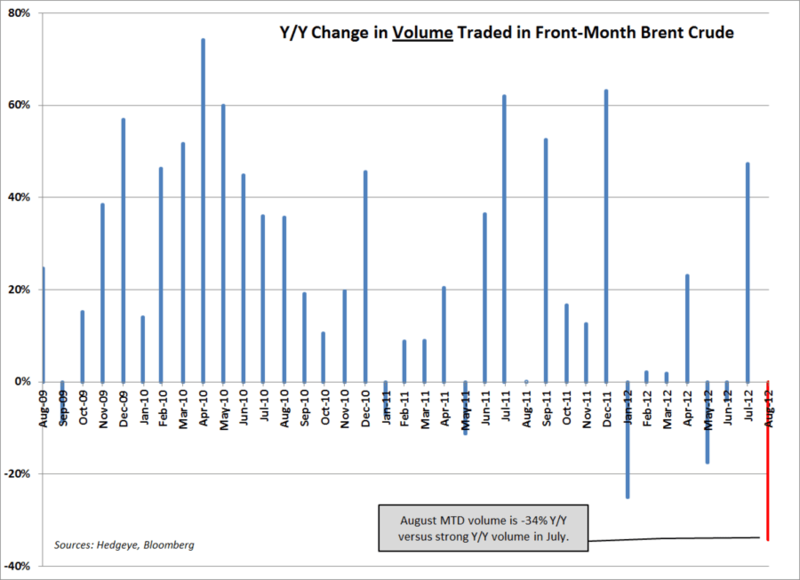 That is the largest monthly Y/Y decline in Brent volume since the financial crisis. Volatility and price tend to be inversely correlated. We often speak to the relationship between the VIX index and the S&P500: since 2007 a VIX near 15 has been an excellent time to sell US equities. Oil and oil volatility (OVIX) act similarly: the mid-20’s on the OVIX seems to indicate complacency (bullishness), and a good exit signal. The OVIX currently sits at 29.90, down from early-June high of 42. The oil market is well-supplied. Real-time data on global oil production is not readily available, though the two most important producing regions – North America (as the marginal cost producer) and OPEC (as the largest producer by volume) – keep relatively current numbers. 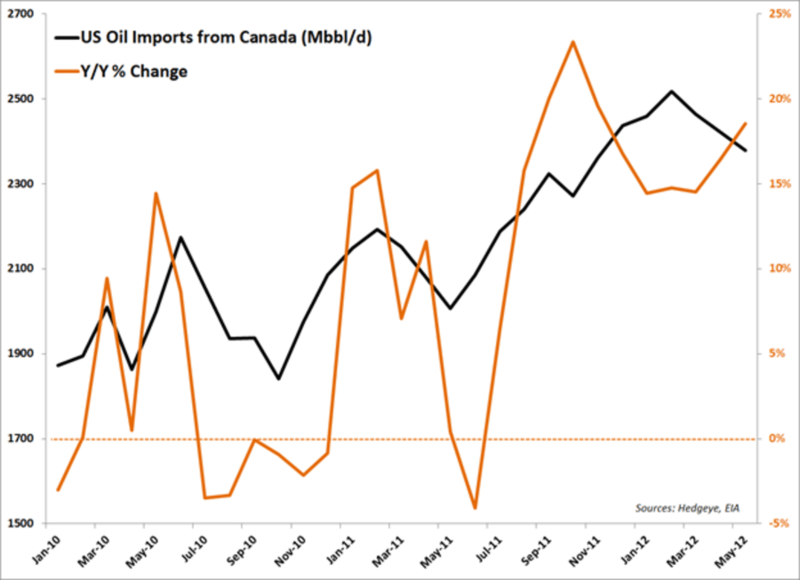 On the former, US oil production was +11% Y/Y in May near 6.3MM bbls/d; and US imports from Canada were +19% Y/Y to 2.4MM bbls/d. While North America is still a significant net importer of crude, shale and oil sands production has lifted production to the highest level in more than a decade. OPEC production has been on a similar upward trajectory since the 2011 Arab Spring took Libya’s production from 1.6MM bbls/d to 0 in six months; Saudi Arabia stepped up to fill that gap, increasing production from 8.2MM bbls/d in late 2010 to 9.8 MMbbls/d as of July 2012. 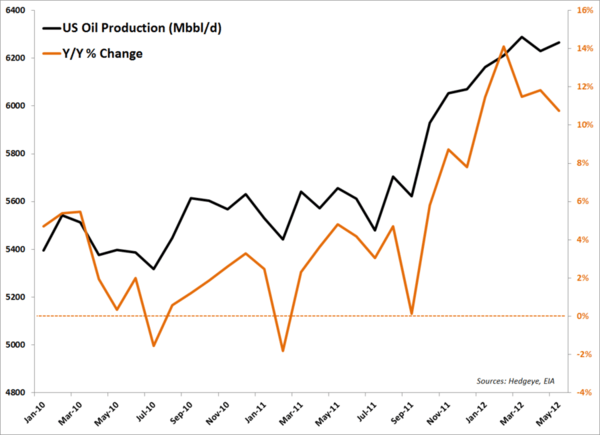 But now that Libya is back producing 1.5MM bbls/d, the increased output from Saudi serves to fill the Iranian void. Iran’s oil production has been in steady decline since the financial crisis, though output has fallen more rapidly in 2012 due to sanctions. Output has slipped from 3.6MM bbls/d in Dec 2011 to 2.9MM bbls/d in July 2012. Aside from Iran most OPEC nations have increased production Y/Y, including Kuwait, the UAE, and Venezuela. 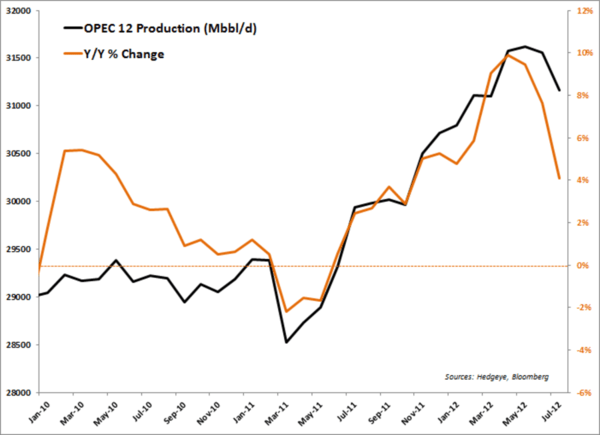 In aggregate, production from the OPEC 12 (OPEC + Iraq) is just off its post-2007 high and +4% Y/Y. The Buzzard oilfield, the largest in the UK North Sea will be down for several weeks of maintenance in September. That will take ~200 Mbbl/d of Forties crude (sets the price of Brent) off the market. With that outage, as well as planned maintenance at other North Sea fields (Norway’s Troll) and natural declines, supply from the North Sea could shrink by as much as 300 Mbbl/d in September – though the decline is planned and transitory. 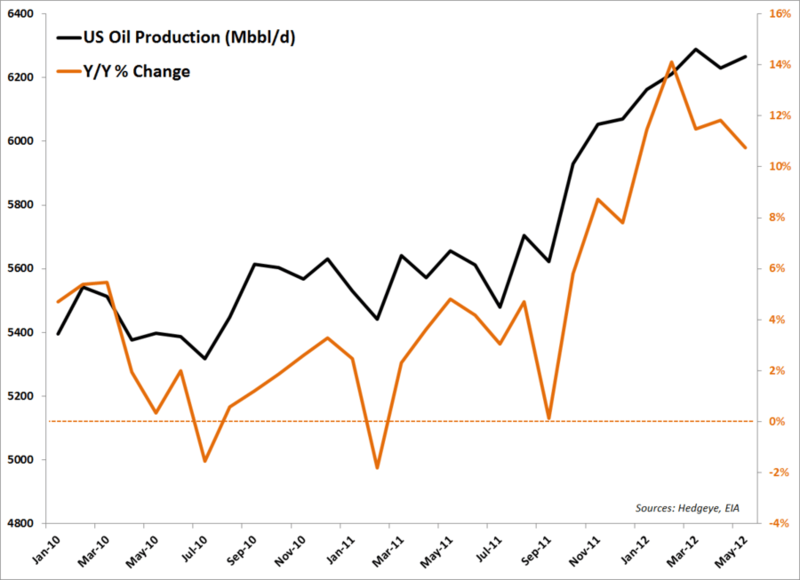 The expectation of this output loss could have much to do with Brent’s rise in the last 2 months. On the other hand, the return of the production (mid-October) should be an equal headwind. Russia – the world’s top oil producer in 2011 – pumped 10.3MM bbls/d in 2011, the highest level since 1990. Putin and Co. aim to increase production 1% in 2012 after a 1.2% rise in 2011, and indeed, the Energy Ministry said that production for 1H12 was +1.1% Y/Y. But June production slipped slightly from May, and fears are that growth has hit a capacity wall. Syria and South Sudan are struggling with civil and political unrest, putting ~500 Mbbl/d at risk. Looking at the divergence in the prices of Brent crude, copper, and gold can help shed some light on the key factors driving each. 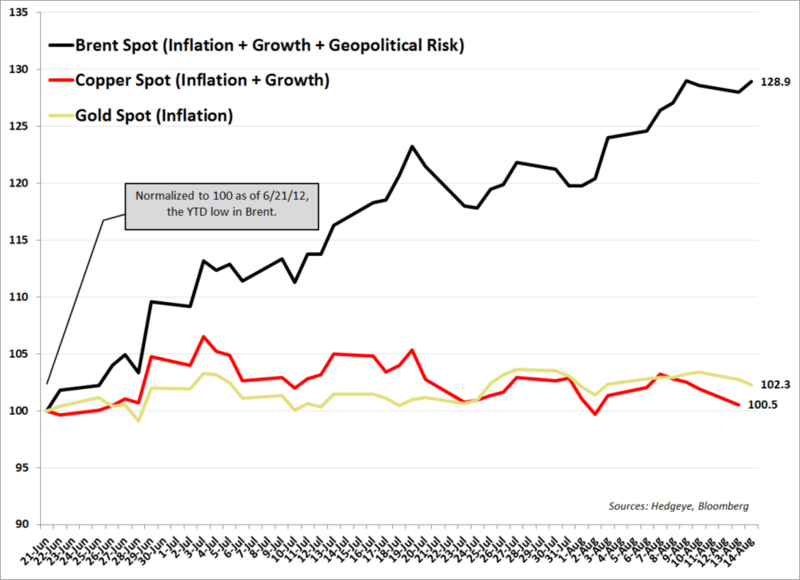 We argue that, generally speaking, gold is a proxy for inflation expectations; copper is a proxy for inflation + growth expectations; and that oil is a proxy for inflation + growth + geopolitical risk expectations. The chart below shows the price performance of each since Brent crude put in its YTD low on 6/21/12: Brent is +28.9%, gold is +2.3%, and copper is +0.5%. Brent’s sharp divergence from gold and copper highlights the geopolitical risk premium currently baked into crude (and to a certain extent, energy equities); while copper underperforming gold is a growth slowing signal. The mainstream attention that the ever-present Israel/Iran conflict gets tends to ebb and flow; whether increased rhetoric will precede serious action, we just don’t know. But consider this: at 4.05 the Israeli shekel is near its strongest versus the US dollar since 2009; the Tel-Aviv 25 Index is +3% over the last month and +0.6% YTD; and CDS on the 5Y government bond is at 153 bps (just off the YTD low of 140). 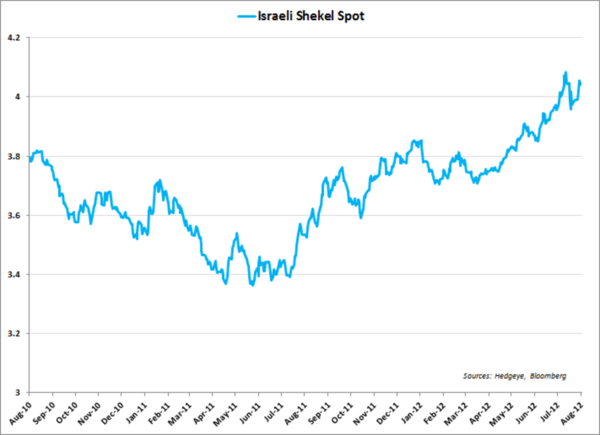 Curiously, the price of oil is the only one that suggests action is imminent in the Mid-East. 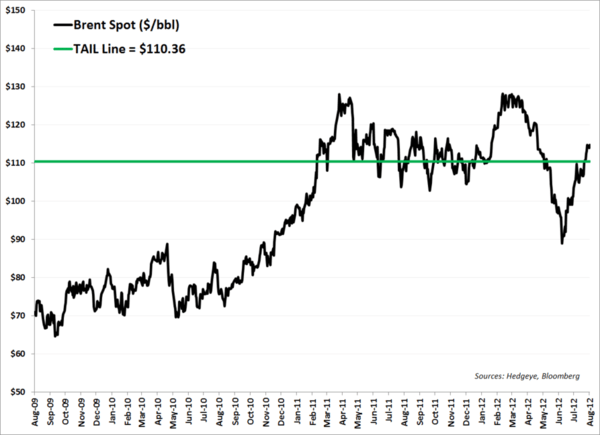 From a long-term perspective, investors are bullish on crude oil (given the cyclical nature of crude prices, we consider overly bullish sentiment a contrarian indicator). We argue that, “Over the long-term, oil prices are heading higher” is one of the most consensus views in global macro – we hear it all the time. It’s an easy side to stand on after oil prices have gone up 15% per annum (nominal) since 2001. 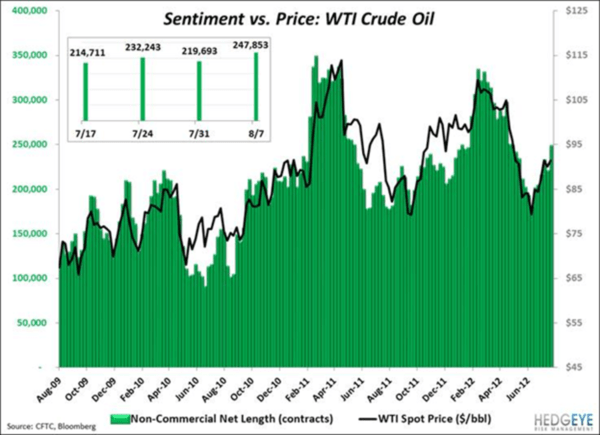 To the point, non-commercial (hedge funds, etc) net length (longs minus shorts) in NYMEX crude is currently at +248k. Between 1995 and 2000 the average net length was +15k contracts; between 2000 and 2010 it was +61k contracts; and the market has not been net short crude oil since 2003. Looking at the more immediate-term, net length in NYMEX oil increased 13% w/w to +248k contracts for the week ended 8/7; that is the largest one-week gain since Feb ’12 and hedge funds are the most bullish they’ve been on crude oil in 3 months.